In an organic luminescence device formed of one or plural layers of organic films between an anode and a cathode, at least one layer is any one of a luminescence layer, an electron injection layer and an electron-transporting layer and is formed of at least a spiro compound of formula (I-a) or (I-b) having a carbon atom or a silicon atom as a spiro atom and having four ring structures including at least one nitrogen atom-containing ring structure. By the use of the spiro compound of the formula (I-a) or (I-b), the resultant organic luminescence device produces a high-luminance fluorescent luminescence at a low voltage for a long period of time. According to a study by Eastman Kodak Co. (“Appl. Phys. Lett.”, vol. 51, pp. 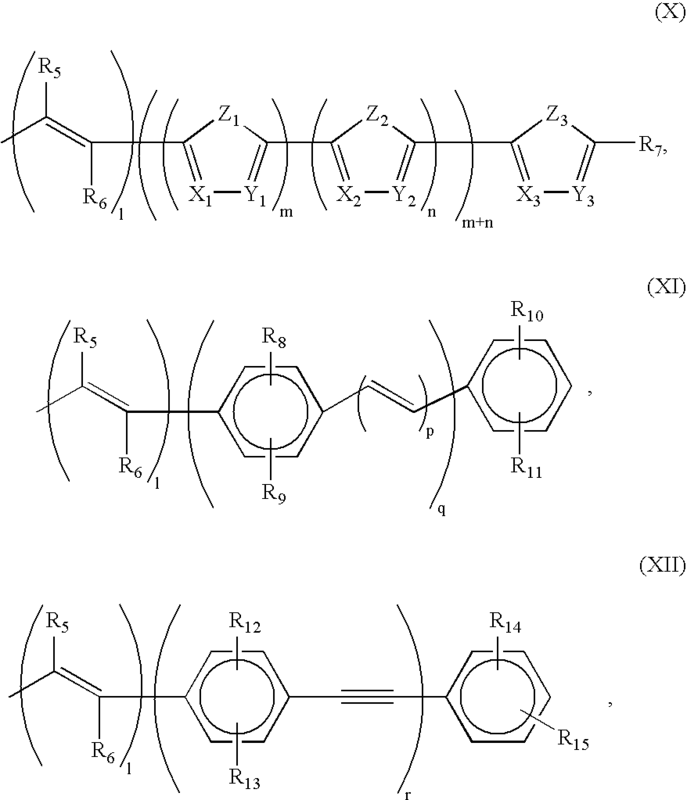 913-(1987)), it has been reported that a function-separation type organic luminescence layer comprising mutually laminated two layers including a layer of an aluminum quinolinol complex (as an electron transporting and luminescent material) and a layer of a triphenylamine derivative (as a hole transporting material) causes luminescence at a luminance (brightness) of ca. 1,000 cd/m 2 under application of a voltage of ca. 10 volts. This is also reported in, e.g., U.S. Pat. Nos. 4,539,507; 4,720,432 and 4,885,211.
q and r are respectively an integer of 2-30. FIGS. 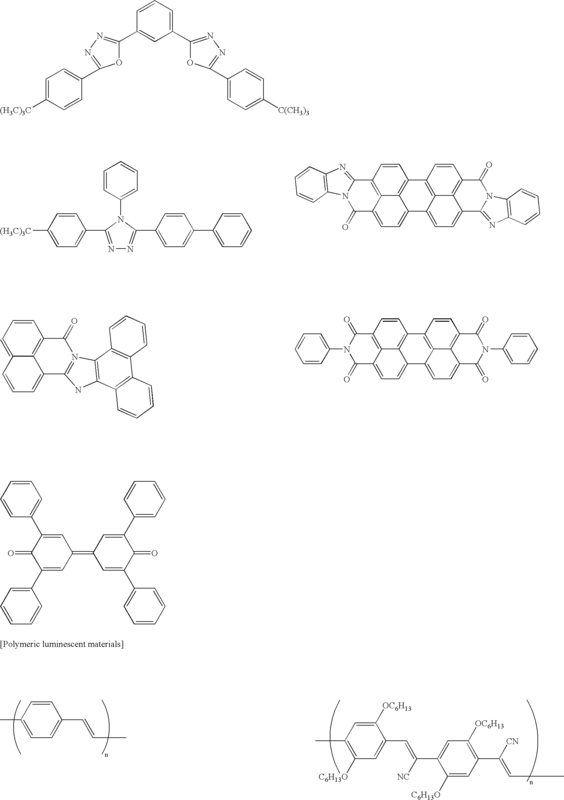 1 to 4 are schematic sectional views each illustrating a basic structure of an organic luminescence device according to an embodiment of the present invention. wherein R 1 to R4 independently denote a hydrogen atom, an alkyl group, a substituted or unsubstituted aralkyl group, a substituted or unsubstituted aryl group, a substituted or unsubstituted heterocyclic group, an alkoxy group, a nitro group, or a substituted or unsubstituted amino group. In the organic luminescence device of the present invention at least one of L 1 to L4 in the formula (I-a) or (I-b) may preferably be the above-mentioned group represented by any one of the formulas (X), (XI) and (XII) since the resultant spiro compound has a high glass transition point to improve a stability of the organic luminescence device and the resultant emission wavelength is shifted to a longer wavelength side. Further, in the organic luminescence device of the present invention, the layer comprising at least one species of the spiro-compound of the formula (I-a) or (I-b) may preferably be used as electron injection layer, an electron-transporting or a luminescence layer. 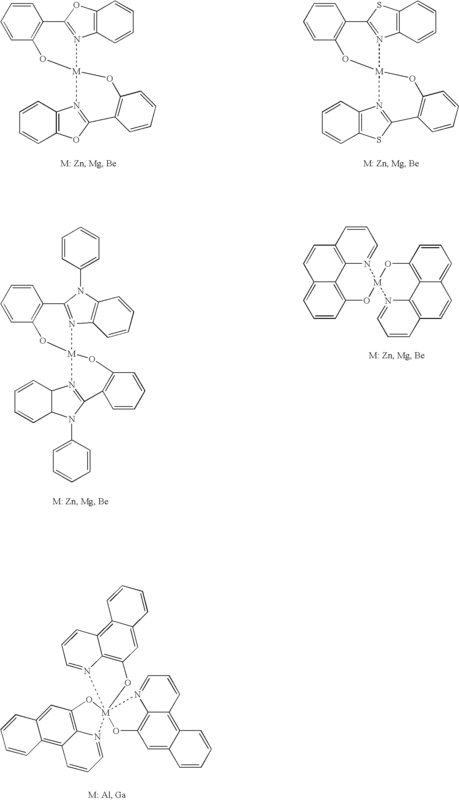 Specific examples of the groups represented by K 1 to K4, L1 to L4 and R1 to R21 in the above-mentioned formula (I-a) to (IX-a), (I-b) to (IX-b) and (X) to (XII) are enumerated hereinbelow. Furtheri specific examples of the preferred groups represented by the above-mentioned formulas (X), (XI) and (XII) as the groups L 1 to L4 in the formula (I-a) or (I-b) may include those (A-1 to A-15) shown below. Other specific examples of the groups L 1 to L4 may include those (B-1 to B-16) shown below. Specific examples (Example Compound Nos. 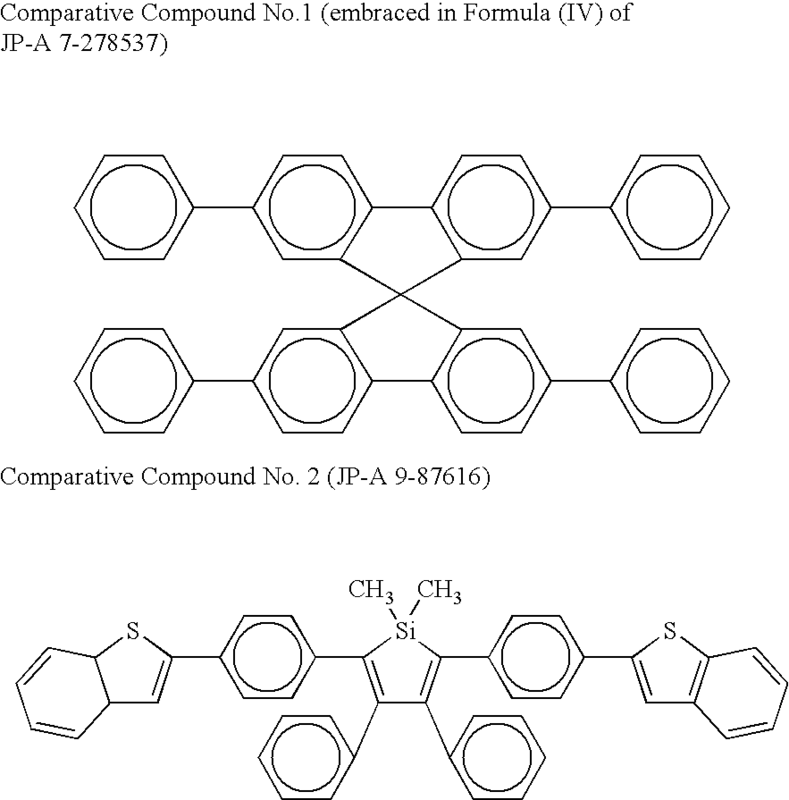 a-1 to a-43 and b-1 to b-39) of the Spiro compounds of the formulas (I-a) and (I-b) are enumerated in Tables 1-16 hereinafter separately for the respective preferred formulas (II-a) to (IX-a) and (II-b) to (IX-b) wherein some representative structures for the groups L 1 and L4 are identified by symbols A-1 to A-15 and B-1 to B-16 shown above, and “Ph” represents a phenyl group. Further, the respective numerals in parentheses for the groups R 1 to R4 represent their substitution positions, respectively, specifically indicated in the formulas (II-a) to (IX-a) and (II-b) to (IX-b). 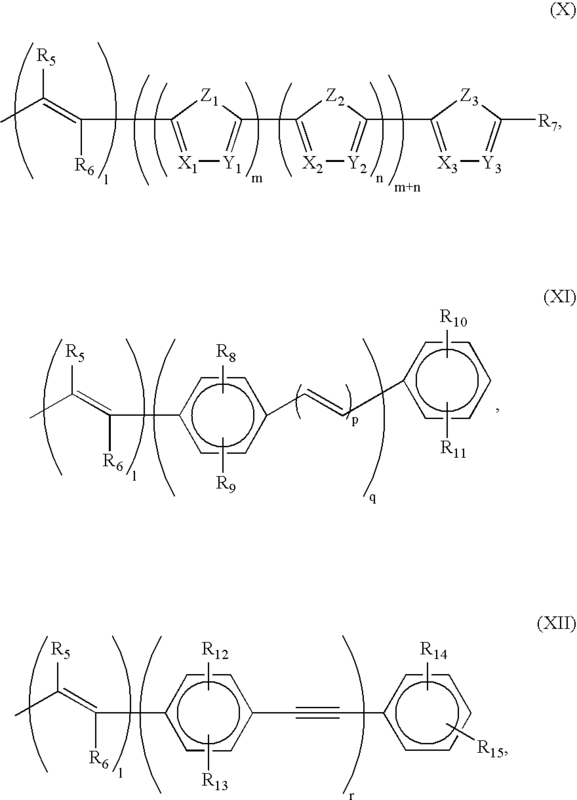 The organic compound layer(s) constituting the organic luminescence device of the present invention may have a single-layer structure as shown in FIG. 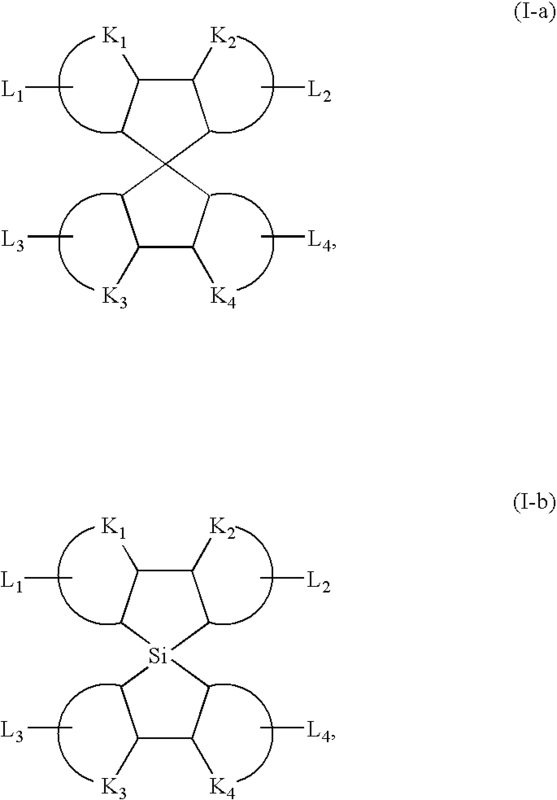 1 or a laminate structure of two or more layers as shown in FIGS. 2, 3 and  4. More specifically, FIG. 1 is a schematic sectional view illustrating an embodiment of the organic luminescence device of the present invention. Referring to FIG. 1, the organic luminescence device includes a substrate  1, and an anode 2, a luminescence layer 3 and a cathode disposed in this order on the substrate 1 so as to form a laminate structure. The luminescence layer 3 may comprise a single species of luminescent material exhibiting a hole-transporting function, an electron-transporting function and a luminescence function in combination or a mixture of plural compounds exhibiting these functions, respectively. The luminescence layer 3 may have a thickness of 5 nm to 1 μm, preferably 10-500 nm. FIG. 2 is a sectional view showing a laminate structure of another embodiment of the organic luminescence device. Referring to FIG. 2, the organic luminescence device includes a substrate  1, and an anode 2, a hole-transporting layer 5, an electron-transporting layer 6 and a cathode 4 disposed successively in this order on the substrate 1 so as to form a laminate structure. In this case, either one or both of the hole-transporting layer 5 and the electron-transporting layer 6 may contain a luminescent material also having a hole-transporting function and/or an electron-transporting function, respectively, for constituting a luminescence layer 3 in combination. One of the layers 6 and 5 may contain a material having no luminescent function but having a good electron-transporting or hole-transporting function. Each of the hole-transporting layer 5 and the electron-transporting layer 6 may have a thickness of 5 nm to 1 μm, preferably 10-500 nm. FIG. 3 is a sectional view showing still another embodiment of the organic luminescence device of the present invention. Referring to FIG. 3, the organic luminescence device includes a substrate  1, and an anode 2, a hole-transporting layer 5, a luminescence layer 3, an electron-transporting layer 6 and a cathode 4 disposed successively in this order on the substrate 1 to form a laminate structure. In this embodiment, the carrier transporting functions and the luminescent function of the organic compound layer are separated and assigned to the respective layers. Each of the hole-transporting layer 5, the luminescence layer 3 and the electron-transporting layer 6 may contain a single species or plural species of compounds showing respectively expected functions so as to exhibit desired performances. 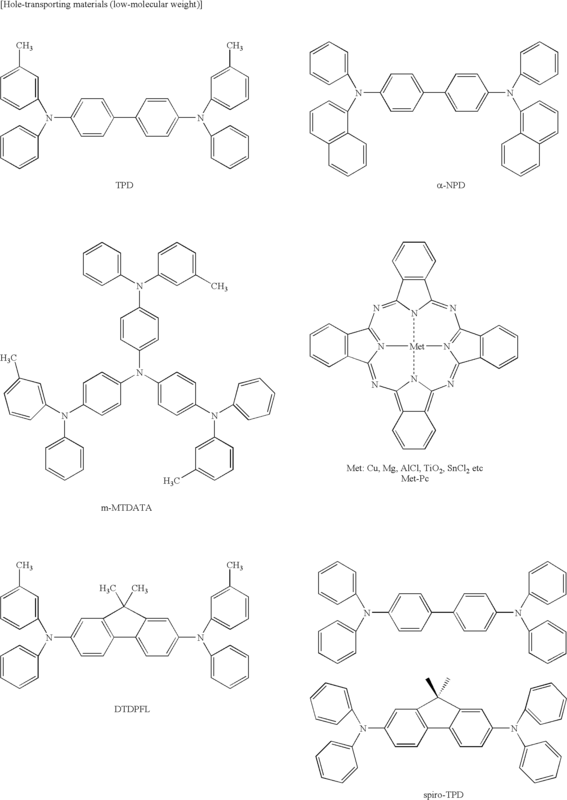 More specifically, in the case of using plural species of compounds in combination, a lot of latitude is provided in selection of materials for each layer, and various compounds having different emission wavelengths can be used to provide a variety of luminescence hues. Further, as the carriers and excitons are effectively confined in the central luminescence layer  3, it is possible to increase the luminescence efficiency. In the embodiment of FIG. 3, each of the hole-transporting layer  5, the luminescence layer 3 and the electron-transporting layer 6 may have a thickness of 5 nm-1 μm, preferably 10-500 nm. FIG. 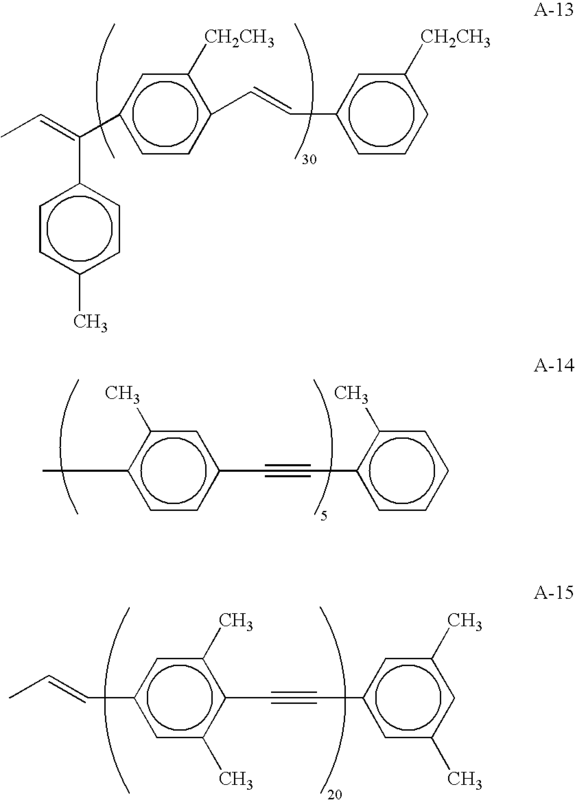 4 is a sectional view showing another embodiment of the organic luminescence device. Referring to FIG. 4, the organic luminescence device includes a substrate  1, and an anode 2, a hole-transporting layer 5, an electron-transporting layer 6, an electron injection layer 7 and a cathode 4 disposed successively in this order on the substrate 1 so as to form a laminate structure. The electron injection layer 7 is disposed in order to efficiently inject electrons from the cathode 4 into the electron-transporting layer 6, thus functionally separating an electron injection performance and an electron-transporting performance, respectively, rom the cathode 4. 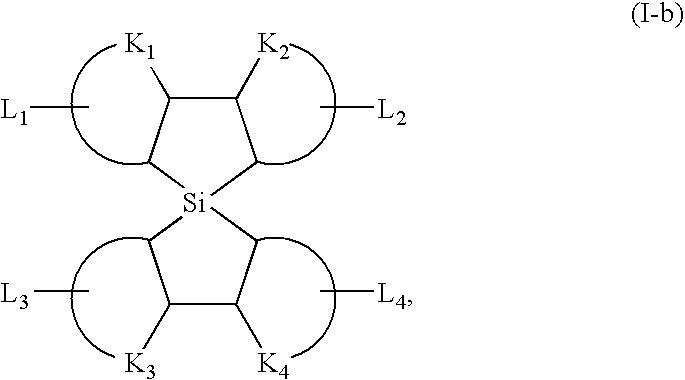 Each of the hole-transporting layer 5, the electron-transporting layer 6 and the electron injection layer 7 may have a thickness of 5 nm to 1 μm, preferably 10-500 nm. It is to be understood however that FIGS. 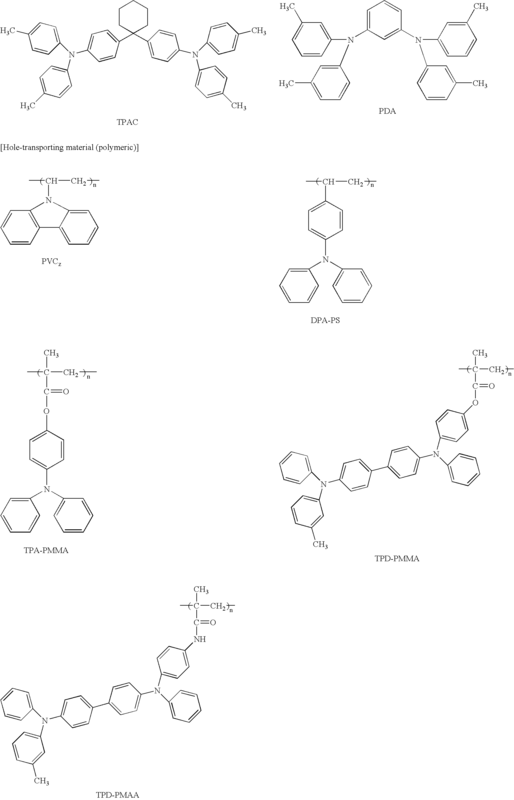 1-4 described above merely show basic structures of the organic luminescence device according to the present invention, and various modifications thereof are possible. For example, between the organic compound layer(s) and the electrodes (anode and cathode), it is possible to dispose an insulating layer, an adhesive layer, or an interference layer. Further, the hole-transporting layer 5 can be divided into two layers with different ionization potentials. 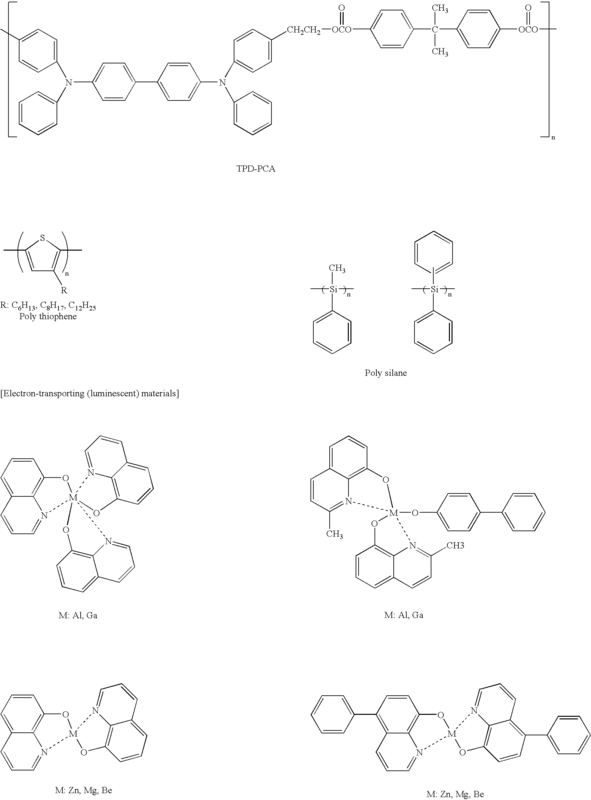 The spiro compound represented by the formula (I-a) or (I-b) have better electron injection performance, electron-transporting performance, luminescence performance and durability than conventional compounds and can be adopted in any of the device structures shown in FIGS. 1 to 4. As a material for the anode ( 2 shown in FIGS. 1 -4), it is preferred to use one having as large a work function as possible, examples of which may include: metals, such as gold, platinum, nickel, palladium, cobalt, selenium and vanadium, and their alloys; metal oxides, such as tin oxide, zinc oxide, indium tin oxide (ITO), and indium zinc oxide; and electroconductive polymers, such as polyaniline, polypyrrole, polythiophene, and polyphenylene sulfide. 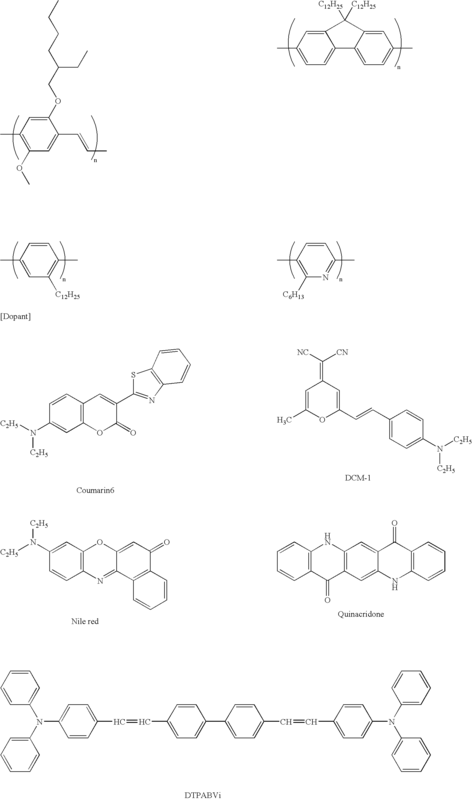 These compounds may be used singly or in combination of two or more species. 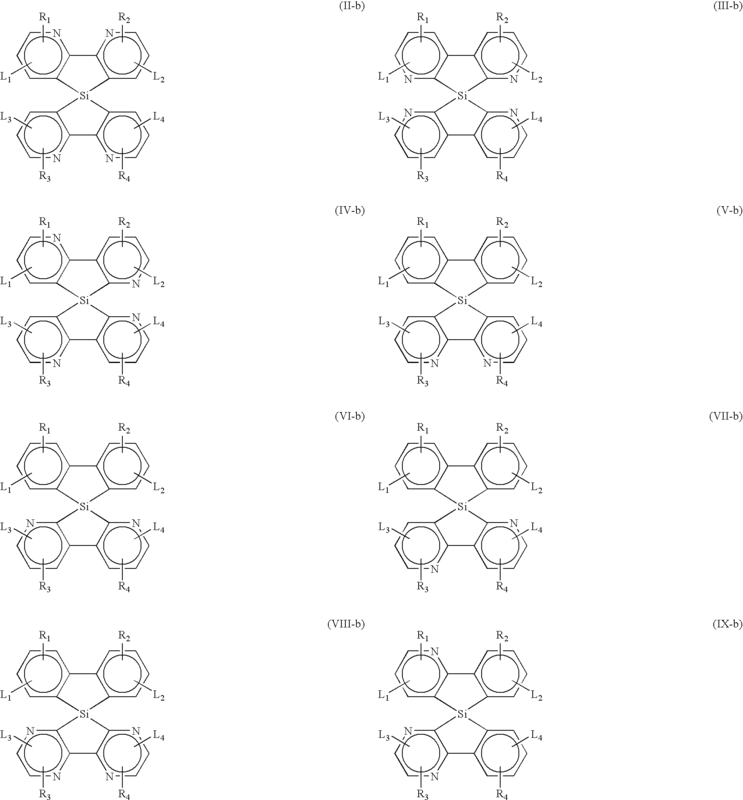 On the other hand, as a material for the cathode  4 shown in FIGS. 1-4, it is preferred to use one having a small work function, examples of which may include: metals, such as lithium, sodium, potassium, calcium, magnesium, aluminum, indium, silver, lead, tin and chromium, and their alloys. It is also possible to use metal oxide, such as indium tin oxide (ITO). The cathode may be formed in a single layer or a lamination of plural layers. The substrate  1 shown in FIGS. 1-4 for the organic luminescence device of the present invention may include an opaque substrate of metal, ceramics, etc., and a transparent substrate of glass, quartz, plastics, etc. It is possible to form the substrate with a color filter film, a fluorescent color conversion film, a dielectric reflection film, etc., thus controlling emitted luminescent light. A 0.7 mm-thick glass substrate (substrate 1) coated with a 120 nm-thick film of ITO (indium tin oxide) (anode  2) formed by sputtering was successively washed with acetone and isopropyl alcohol (IPA) under application of ultrasonic wave and then washed with IPA under boiling, followed by cleaning by UV/ozone (i.e., irradiation with ultraviolet rays in the ozone-containing atmosphere), to obtain a transparent conductive substrate (including the substrate 1 and the ITO anode 2 formed thereon). to form a 70 nm-thick hole-transporting layer  5 and then by vacuum deposition of a spiro compound (Example Compound No. 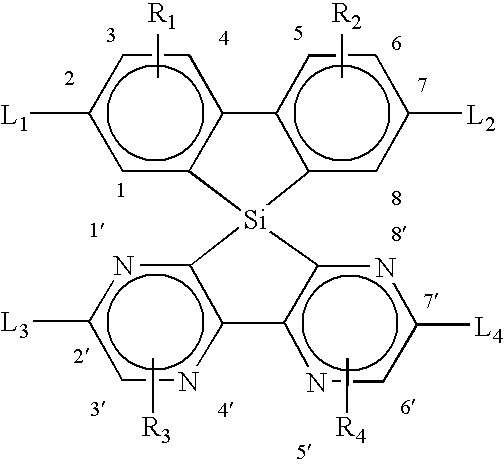 a-1 listed in Table 1) to form a 70 nm-thick electron-transporting layer 6. The vacuum deposition was respectively performed in a vacuum of 1.0×10−5 Pa and at a film thickness growth rate of 0.2-0.3 nm/sec. Then, the electron-transporting layer  6 was further coated by vacuum deposition of Al—Li alloy (Li content: 1 atom %) to form a 150 nm-thick metal film (cathode 4) under a vacuum of 1.0×10−4 Pa and at a film thickness growth rate of 1.0-1.2 nm/sec, thereby forming an organic luminescence device of a structure shown in FIG. 2. The thus-obtained device was then supplied with a DC voltage of 8 volts between the ITO electrode  2 as an anode and the Al—Li alloy electrode 4 as a cathode, whereby a current flowed at a density of 8.5 mA/cm2 and red luminescence was observed at a luminance of 600 cd/m2. The device was further subjected to 100 hours of continuous voltage application at a constant current density of 7.0 mA/cm2 in a nitrogen atmosphere, whereby the device initially exhibited a luminance of 520 cd/m2, which was lowered to 490 cd/m2 after 100 hours, thus showing only a small luminance deterioration. The procedure of Example A-1 was repeated up to the formation of the hole-transporting layer  5. Then, the hole-transporting layer  5 was further coated by vacuum deposition of a mixture of spiro compound (Ex. Compound No. a-2) and aluminum tris(quinolinol) in a weight ratio of 1:20 to form a 70 nm-thick electron-transporting layer 6 under a vacuum of 1.0×10−4 Pa and at a film thickness growth rate of 0.2-0.3 nm/sec. Then, the electron-transporting layer  6 was further coated by vacuum deposition of Al—Li alloy (Li content: 1 atom. %) to form a 150 nm-thick metal film 4 under a vacuum of 1.0×10−4 Pa and at a film thickness growth rate of 1.0-1.2 nm/sec, thereby forming an organic luminescence device of a structure shown in FIG. 2. The thus-obtained device was then supplied with a DC voltage of 8 volts between the ITO electrode  2 as an anode and the Al—Li alloy electrode 4 as a cathode, whereby a current flowed at a density of 9.0 mA/cm2 and orange luminescence was observed at a luminance of 830 cd/m2. The device was further subjected to 100 hours of continuous voltage application at a constant current density of 7.0 mA/cm2 in a nitrogen atmosphere, whereby the device initially exhibited a luminance of 640 cd/m2, which was lowered to 590 cd/m 2 after 100 hours, thus showing only a small luminance deterioration. Then, the hole-transporting layer  5 was further coated by vacuum deposition of aluminum tris(quinolinol) to form a 30 nm-thick luminescence layer 3 and then by vacuum deposition of a spiro compound (Ex. Compound No. a-8) to form a 50 nm-thick electron-transporting layer 6, respectively under a vacuum of 1.0×10−4 Pa and at a film thickness growth rate of 0.2-0.3 nm/sec. Then, the electron-transporting layer  6 was further coated by vacuum deposition of Al—Li alloy (Li content: 1 atom. %) to form a 150 nm-thick metal film 4 under a vacuum of 1.0×10−4 Pa and at a film thickness growth rate of 1.0-1.2 nm/sec, thereby forming an organic luminescence device of a structure shown in FIG. 3. The thus-obtained device was then supplied with a DC voltage of 10 volts between the ITO electrode  2 as an anode and the Al-Li alloy electrode 4 as a cathode, whereby a current flowed at a density of 12.0 mA/cm2 and yellow luminescence was observed at a luminance of 1270 cd/m2. The device was further subjected to 100 hours of continuous voltage application at a constant current density of 10.0 mA/cm2 in a nitrogen atmosphere, whereby the device initially exhibited a luminance of 1080 cd/m2, which was lowered to 990 cd/m2 after 100 hours, thus showing only a small luminance deterioration. A transparent conductive substrate prepared and treated for cleaning in the same manner as in Example A-1 was coated with a solution of 0.050 g of a spiro compound (Ex. Comp. No. a-1) and 1.00 g of poly-N-vinylcarbazole (weight-average molecular weight=63,000) in 80 ml of chloroform by spin coating at a rate of 2000. rpm, followed by drying, to form a 120 nm-thick luminescence layer  3. Then, the luminescence layer  3 was further coated by vacuum deposition of Al—Li alloy (Li content: 1 atom %) to form a 150 nm-thick metal film 4 under a vacuum of 1.0×10−4 Pa and at a film thickness growth rate of 1.0-1.2 nm/sec, thereby forming an organic luminescence device of a structure shown in FIG. 1. The thus-obtained device was then supplied with a DC voltage of 10 volts between the ITO electrode  2 as an anode and the Al—Li alloy electrode 4 as a cathode, whereby a current flowed at a density of 9.5 mA/cm2 and red luminescence was observed at a luminance of 450 cd/m2. The resultant device was similarly supplied with a DC voltage of 10 volts, whereby a current followed at a density of 9.0 mA/cm 2 and yellow-green luminescence was observed at a luminance of 30 cd/m2. A 0.7 mm-thick glass substrate (substrate  1) coated with a 120 nm-thick film of ITO (indium tin oxide) (anode 2) formed by sputtering was successively washed with acetone and isopropyl alcohol (IPA) under application of ultrasonic wave and then washed with IPA under boiling, followed by cleaning by UV/ozone (i.e., irradiation with ultraviolet rays in the ozone-containing atmosphere), to obtain a transparent conductive substrate (including the substrate 1 and the ITO anode 2 formed thereon). 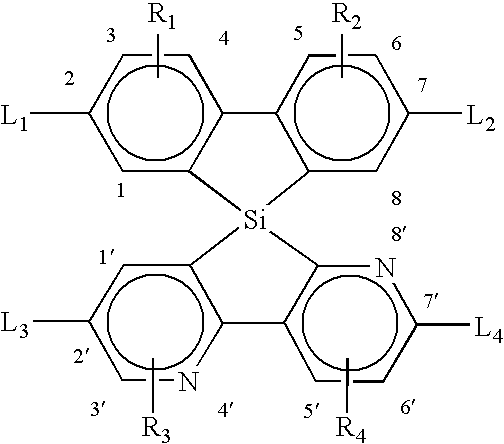 to form a 70 nm-thick hole-transporting layer  5 and then by vacuum deposition of a spiro compound (Example Compound No. b-1 listed in Table 9) to form a 70 nm-thick electron-transporting layer 6. The vacuum deposition was respectively performed in a vacuum of 1.0×10−4 Pa and at a film thickness growth rate of 0.2-0.3 nm/sec. The thus-obtained device was then supplied with a DC voltage of 8 volts between the ITO electrode  2 as an anode and the Al—Li alloy electrode 4 as a cathode, whereby a current flowed at a density of 8.0 mA/cm2 and red luminescence was observed at a luminance of 560 cd/m2. The device was further subjected to 100 hours of continuous voltage application at a constant current density of 7.0 mA/cm2 in a nitrogen atmosphere, whereby the device initially exhibited a luminance of 510 cd/m2, which was lowered to 485 cd/m2 after 100 hours, thus showing only a small luminance deterioration. The procedure of Example B-1 was repeated up to the formation of the hole-transporting layer  5. Then, the hole-transporting layer  5 was further coated by vacuum deposition of a mixture of spiro compound (Ex. Compound No. b-2) and aluminum tris(quinolinol) in a weight ratio of 1:20 to form a 70 nm-thick electron-transporting layer 6 under a vacuum of 1.0×10−4 Pa and at a film thickness growth rate of 0.2-0.3 nm/sec. The thus-obtained device was then supplied with a DC voltage of 8 volts between the ITO electrode  2 as an anode and the Al—Li alloy electrode 4 as a cathode, whereby a current flowed at a density of 8.5 mA/cm2 and orange luminescence was observed at a luminance of 800 cd/m2. The device was further subjected to 100 hours of continuous voltage application at a constant current density of 7.0 mA/cm2 in a nitrogen atmosphere, whereby the device initially exhibited a luminance of 620 cd/m2, which was lowered to 590 cd/m2 after 100 hours, thus showing only a small luminance deterioration. Then, the hole-transporting layer  5 was further coated by vacuum deposition of aluminum tris(quinolinol) to form a 30 nm-thick luminescence layer 3 and then by vacuum deposition of a spiro compound (Ex. Compound No. b-4) to form a 50 nm-thick electron-transporting layer 6, respectively under a vacuum of 1.0×10−4 Pa and at a film thickness growth rate of 0.2-0.3 nm/sec. The thus-obtained device was then supplied with a DC voltage of 10 volts between the ITO electrode  2 as an anode and the Al—Li alloy electrode 4 as a cathode, whereby a current flowed at a density of 11.0 mA/cm2 and yellow luminescence was observed at a luminance of 1050 cd/m2. The device was further subjected to 100 hours of continuous voltage application at a constant current density of 10.0 mA/cm2 in a nitrogen atmosphere, whereby the device initially exhibited a luminance of 980 cd/m2, which was lowered to 930 cd/m2 after 100 hours, thus showing only a small luminance deterioration. A transparent conductive substrate prepared and treated for cleaning in the same manner as in Example B-1 was coated with a solution of 0.050 g of a spiro compound (Ex. Comp. No. b-1) and 1.00 g of poly-N-vinylcarbazole (weight-average molecular weight=63,000) in 80 ml of chloroform by spin coating at a rate of 2000 rpm, followed by drying, to form a 120 nm-thick luminescence layer  3. The thus-obtained device was then supplied with a DC voltage of 10 volts between the ITO electrode  2 as an anode and the Al—Li alloy electrode 4 as a cathode, whereby a current flowed at a density of 9.0 mA/cm2 and orange luminescence was observed at a luminance of 410 cd/m2. 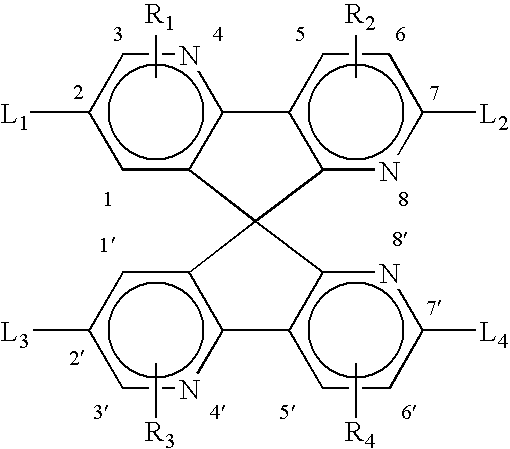 wherein R1 to R4 independently denote a hydrogen atom, an alkyl group, a substituted or unsubstituted aralkyl group, a substituted or unsubstituted aryl group, a substituted or unsubstituted heterocyclic group, an alkoxy group, a nitro group, or a substituted or unsubstituted amino group. 3. An organic luminescence device according to claim 1, wherein at least one of L1 to L4 is said it group represented by any one of the formulas (X), (IX) and (XII). 4. An organic luminescence device according to claim 1, wherein said layer comprising at least one species of the compound of the formula (I-a) comprises an electron injection layer, an electron-transporting layer or a luminescence layer. 7. 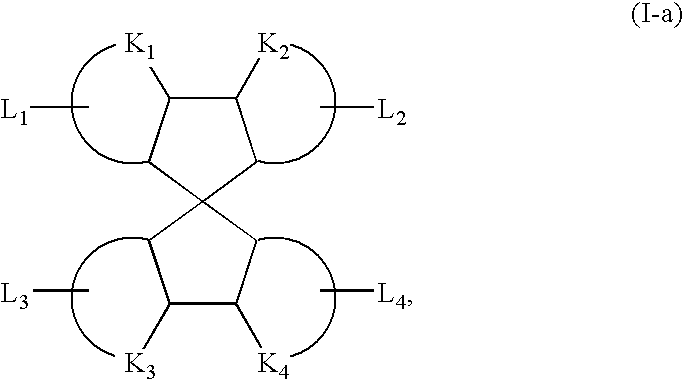 An organic luminescence device according to claim 5, wherein at least one of L1 to L4 is said group represented by any one of the formulas (X), (IX) and (XII). 8. An organic luminescence device according to claim 5, wherein said layer comprising at least one species of the compound of the formula (I-b) comprises an electron injection layer, an electron-transporting layer or a luminescence layer. 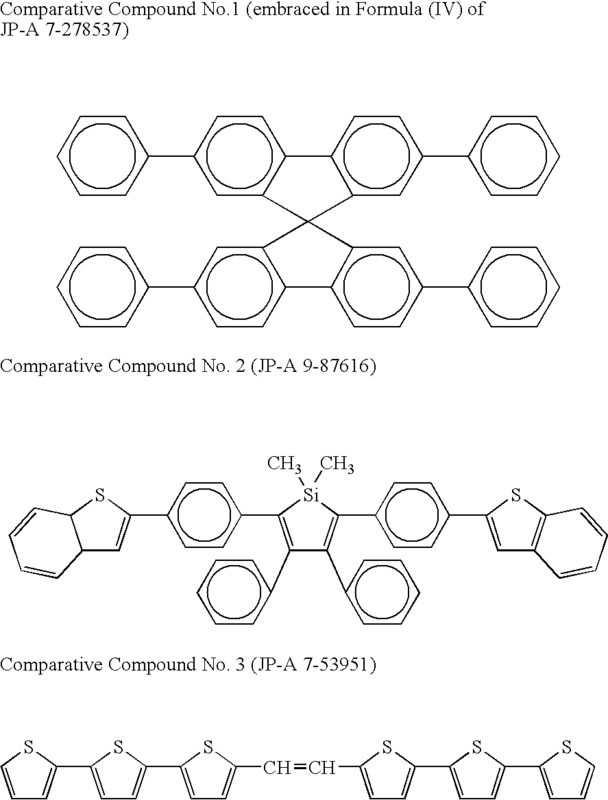 JP3865996B2 (en) 2007-01-10 Specific silane compound and the light-emitting element material consisting, and light emitting devices containing them.